In internet discussions, you may find statements like ‘molten salt reactors are a pie in the sky’ or ‘there is not a single working molten salt reactor on the planet at this present time’. Well, this is an accurate statement at the time of this writing (march 2015). Suppose you see a thundercloud coming to you and the person next to you says ‘well, the sun is shining, who says it is ever going to rain?’ That’s accurate in the same way. I think this comparison is justified because the physics of molten salt reactors is well understood. Often, materials challenges are used as a reason to assert that we may have to wait to the 2030s before we actually see a working MSR. However, these materials challenges, if you really look into the questions what these challenges exactly are, mainly mean that we cannot presently build all variations of MSR’s we’d like to. But for a team with a budget, watched upon by regulatory authorities with knowledgeable personell and a cooperative attitude, it would be no problem at all to build a working MSR in a few years time. In the real world, building new molten salt reactors may not nearly take as long as some believe. Basically, molten salt reactors are not very complicated devices. But if they’re so good, why haven’t we started building these things on a large scale fifty years ago? The answer to that question requires that we do a little history. The history of molten salt reactors is not equally well studied, let alone understood by all commentors. And traditional anti-nuke activists will use every bit of confusion for their favorite hobby: raising doubts. So let’s go quickly to some clarifying historical data. So far, the world has seen three working molten salt reactors. The first one was the so called Aircraft Reactor (don’t worry, it never really flew). The ARE, as it’s called, ran for nine days in 1954 and did what it was supposed to do: prove that the principle worked. The second one, the lesser known of the three, was called the PWAR-1, the Pratt and Whitney Aircraft Reactor-1 and ran for a few weeks in 1957. In the years that followed, all knowledge that was build up in these early years of molten salt reactors culminated in the largest of the experiments: the Molten Salt Reactor Experiment (MSRE). Starting in 1965, this third reactor ran flawlessly for 4,5 year. Fortunately, the history of these experiments is carefully described on a number of Wikepidia pages. The general history of these three reactors is described on the general Wikipedia page on molten salt reactors. The MSRE has its own Wikipedia page. 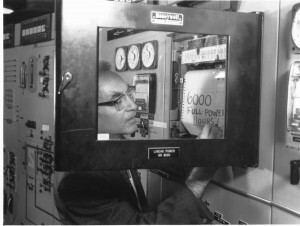 This famous picture shows Alvin Weinberg in 1967, at the time chief scientist at Oak Ridge National Laboratory, Tenessee, proudly noting ‘6000 full power hours’ on the printed measurements log of the molten salt reactor. The only mechanical failure during these years was that one of the two fans of the secondary cooling broke. However, that was a mechanical problem that could have occured anywhere – the nuclear reactor proved to be very reliable and easy to operate. We owe it to Kirk Sorensen that the treasure of the carefully build up documentation of the Oak Ridge experiments has become publicly available on the internet. Kirk Sorensen has spoken to many of the Oak Ridge researchers, now well in their eighties. When he asked one of them how it was to work on this breakthrough technology in those years, the answer was that it was boring: the reactor just went on an on – nothing ever happened. Of course, that’s just about the best thing that can possibly be said about a nuclear reactor. The discontinuation of the molten salt reactor experiments in the early 1970s has been the subject of quite a few historic studies. In an overview article of 2014, Jerome Sep et alt. give a simple explanation why the Nixon administration decided to abandon this promising road. They state that the principal technical argument provided for down selection was the large amount of remaining development time for MSRs and their competition for technical talent and facilities with LMFBRs. (U.S. Atomic Energy Commission Devision of Reactor Technology, september 1972). This statement requires some explanation. It refers to a situation in which there were two major nuclear development programs going, both of which included breeding technologies. One was the molten salt technology: in the next stage, the plan was to design and build a 1000MWe molten salt breeder reactor (MSBR). This reactor has never been build. The competing program was working on a completely different technology based on solid fuel: the liquid metal fast breeder reactor (LMFBR). Significantly bigger resources had already been spent on the LMFBR, and at the time it was viewed as already well advanced in 1972. In his memoirs, Alvin Weinberg mentions another more mundane reason why the budget for the MSR program was cut: Oak Ridge was a small, pretty remote town and apart from the researchers at Oak Ridge, very few people in the world understood what they had developed. The competing program had more and better relationships to the politicians who were in charge of the money. There is another, persistent story that often comes up as an explanation for why the molten salt reactor program was abandoned. In this story, it is suggested that certain materials problems were the cause for the abandonment: the embrittlement of structural parts of the reactor, due to the forming of tellurium, a fission product. As is the case with many urban myths, part of it is accurate. The accurate part is that the structural material used, Hastelloy-N exposed to fuel salt was ‘subject to intergranular cracking and irradiation damage caused by reactions in nickel and boron contaminants; the cause of embrittlement being due to the forming of tellurium‘. However: addition of metallic beryllium was found to be a powerful method to limit the corrosion of the container material. Simply put: the materials issue has already been solved in the 1970s. And our materials knowledge has grown exponentially since those days – ask any researcher in the field if there will be materials challenges and the answer will be yes. Ask if they see any showstoppers the answer will be no. In the video below watch Dr. Stephen A. Boyd, solid state chemist, and CEO of Havelide Systems, Inc. providing a basic, yet comprehensive understanding of the science and technology of the molten salt reactor. To the researchers in Oak Ridge involved at the time, the discontinuation of the msr program was incomprehensible. Many had been working on molten salt reactors for large parts of their careers, and to them, the technical succes of msr’s was so obvious that the decision to stop its funding was felt as no less than a personal drama. All of them realized they had their hands on a solution for the looming energy crisis of the world, but the world decided not to look at it. They did what they could to keep the ship afloat. Research on molten salt reactors, although without the financial resources to build real, working reactors, went on at Oak Ridge until the early 1980s. During this period, several concepts have been developed that have recently been picked up by several research groups around the world, including Terrestrial Energy – that is working on a concept that has become known as the Denatured Molten Salt Reactor (DMSR). The Chinese molten salt reactor program is also based on the concepts that have been developed at Oak Ridge. In one of his numerous presentations, Kirk Sorensen tells the anecdote that after he’d put a large number of the research reports of Oak Ridge online around 2008, he was called by his webmaster that ‘somebody in China is downloading all our Oak Ridge Reports’. And the Chinese read them carefully too – presently, one of the best funded programs in the world is the one led by Jiang Mianheng, the son of Jiang Zemin, the man who led China in the 90s. Presently, the U.S. are helping China to build the reactor they failed to build themselves in the 1970s. This brings us to our next point: the near future. On this site, you will find a whole list of groups worldwide that are working like crazy to get their first reactor get critical. Oh, that’s one of these habbits of nuclear pro’s you have to beware of: they use a language that sometimes seems designed to frighten people away. In nuclear speak ‘critical’ does not mean anything is going wrong. It only means that the nuclear reaction gets going. ‘Reaching criticality’ is a sligthly more sophisticated way to say the same thing. 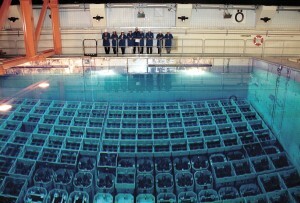 So all these researchers can’t wait to see their reactors go critical. It’s difficult to say which of the groups will be the first one to actually achieve criticality in a newly build molten salt reactor. I’d place my personal bet on either Terrestrial Energy or Thorcon Power. Essentially, because both groups do what anyone aspiring to quickly build a molten salt reactor should do: simply pick up the thread were Oak Ridge left it in the 1980s. Terrestrial Energy has chosen the Denatured Molten Salt Reactor, made a few undisclosed improvements on the core structure and made the strategic choice to not build the best molten salt reactor imaginable, but to build the one they consider most ‘doable’ in the words of founder David LeBlanc. And ‘doable’ does not only take technical considerations in account, but also the allowance process: the designers need to go through a full risk assessment of their many design options, and make their choices in how to deal with them, before they can prove their case to the regulatory authorities. And of course, it helps that Oak Ridge’s finest minds have already adressed many of the issues in the 80s. The first one that Terrestrial Energy aims to build, the Integral Molten Salt Reactor (IMSR) uses the nuclear fuel ‘only’ six times more effecient than a conventional nuclear reactor, but David LeBlanc and his team are simultaneously looking at several options to process the fuel, bring it back into their their molten salt reactors and fully burn it. Thorcon’s plans are even more straightforward: they plan to simply build reactors like the one that spun in Oak Ridge in the 1960s. Both companies are said to be overfunded, and both are already profiting from the knowledge of retired Oak Ridge veterans. It’s going to be an interesting race, of which we’ll see the first results early in the 2020s. And let’s not forget the other contestants. As they focus on more advanced designs, it only makes sense to expect their first results in a slightly more distant future. However, their contribution will be equally meaningful. Programs like the TAP, the DFR, and European projects like EVOL or MOSART also involve fast molten salt reactors, using faster neutrons and with better capabilities of burning spent nuclear fuel from present day reactors. This potential is huge – essentially it means that these fast reactors are especially good at using ‘the remaining 99%’ of the energy content of the uranium and thorium we have mined in the first 70 years of nuclear history. Better store it carefully guys! There’s still 99% of its energy left in what is usually called ‘spent nuclear fuel’ (SNF) or even ‘nuclear waste’. This means that we could power the planet for about 1000 years on the uranium and thorium we have already mined – provided that we produce this energy in a well designed mix of molten salt reactors. So, is there a ‘pie in the sky’? If there is, it’s not a molten salt reactor. The prospect of molten salt reactors is as real as next year: it’s probably going to happen.